This is a repost of the original editorial of Issue 8 of CoFounder Magazine, published in the winter of 2017. There is no question, the world is flat. For startups it is even flatter than for many other industries. The world map here pretty much shows the state of the European startup sector as we enter 2017. 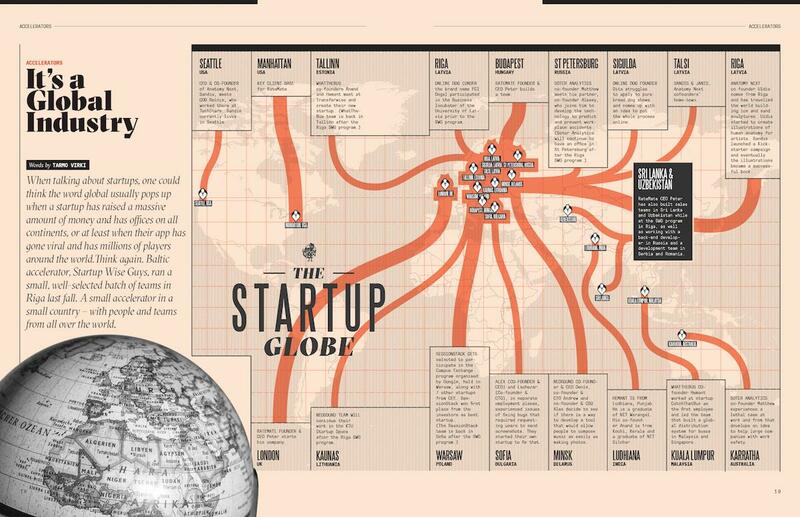 And this totally global map covers barely half-a-dozen teams in a small European accelerator, Startup Wise Guys. They have co-founders from India, Australia, Silicon Valley and from everywhere in between. Countries in Europe are increasingly competing for the innovators from all around the world, creating separate visa programmes or, in the case of Estonia, even a virtual citizenship programme to expand the reach of the country to online, making it almost a Second World. You can live in Pakistan, but run your global online business through an Estonian company without having ever visited the country. I had a plan to stay out of politics with this issue, but as Cardinal Richelieu said in the early 17th century, “If you give me six lines written by the hand of the most honest of men, I will find something in them which will hang him”. We are living in a political time and this editorial has already moved deep into politics. At a time when some countries of the world are closing their borders, you are holding in your hands the most global CoFounder issue to date. We are looking deeply into Chinese business opportunities, fixing the education system in Tanzania, covering a global expansion of Russian robotics, travelling through East Timor to Brazilian slums and giving communities WiFi connections. And we are creating this magazine in Estonia, a country of just over 1 million people in northern Europe. These are the innovation hubs of the new world. For digital workers, the office is where they open their computers and they move pretty much as they wish. Because free people move. For a European, getting a visa in 2017 is a very weird experience – it is a true blast from the past. What happens if you start to close the borders of your country? Yes, you get some right-wingers to vote for you. If your country is big, you will surely be able to get back some of those little-value-added jobs from the manufacturing hubs of the world. Yes, the factories move in as you put up fences around the country. At the same time, brains move out. They did everything they could to escape the Soviet Union or any other totalitarian regime. The brains are looking for places and countries where they can freely mingle with all creative minds. Because free people move, and the brightest run for freedom.